If you come down to the southern foothills of the Greater Caucasus, you can discover a compact but still lively town located there. Shaki is the true pearl of Azerbaijan and Caucasus region. Shaki is one of the most ancient cities of the Caucasus. Located in 380 kilometers from the capital Baku, it was estimately founded in the 8th century BC. Before the current one, Shaki has changed a few names. Initially, it was known as Sakasena or Sake, due to Saka tribes that lived there. Centuries later, it was famous as Nukha. Marvelous Shaki is set in a picturesque mountain area rich of narrow gorges, purest rivers, waterfalls and mineral water springs framed by dense woods and alpine meadows. Shaki has always been associated with fertile valleys and cool mountain pastures (yaylags). The city is surrounded with wonderful orchards all year round. With its almost unspoiled nature, it is a recommended destination for hiking and camping trips. Turning back to history, Shaki was first mentioned as a governmental entity in the late 14th century. In 1743-1819, the city served as the capital of Shaki khanate. Many historical and architectural monuments including caravanserais, mosques, minarets and fortresses have preserved since ancient times in the town. The Palace of Shaki Khans is the most prominent architectural monument of the city. It was built in 1797 by architect Haji Zeynalabdin from Shiraz. This glorious building was erected with no single nail in use. The pictures on the palace walls were painted with oil colors, the windows are covered with magnificent ornaments. What is interesting is that some maples around the palace are even older than the building itself. A remarkable story relates to the Galarsan-Gorarsan fortress. In order to subdue the population of Shaki, the Iranian ruler Nader Shah assembled a large army and attacked the city in 1744. By his order, the city, its fields and gardens were destroyed in a short time. However, he had to besiege the Galarsan-Gorarsan fortress for as many as four months, as Haji Chalabi refuged there. In the end, Nader Shah’s idea of taking the fortress failed, and he was forced to lift his siege and leave Shaki. After their death, Haji Chalabi and his confidants were buried in Djuma Mosque – a prominent building constructed in 1745-1750. The mosque, its minaret and the ancient cemetery today are protected by the state as important historical monuments. 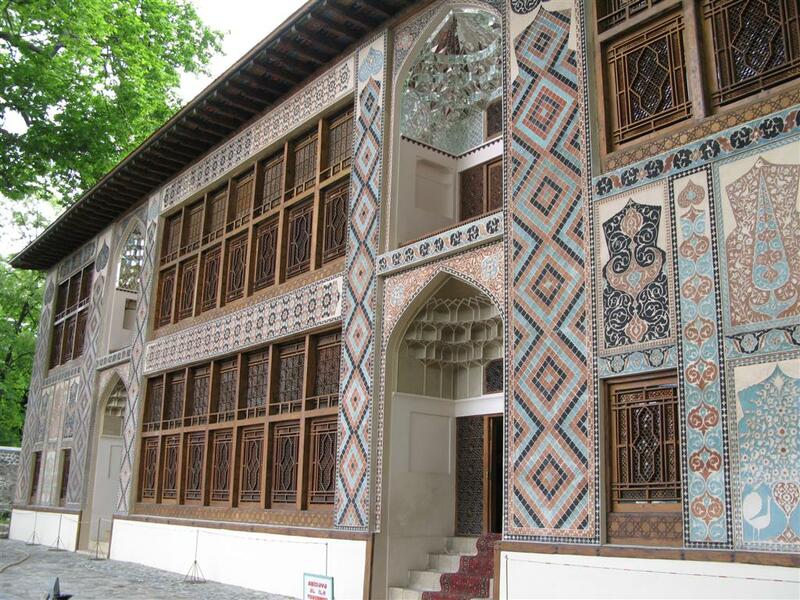 Modern Shaki has its own theatre, a historical museum, the house-museum of the great Azerbaijan writer and philosopher Mirza Fatali Akhundov. Countless masterpieces of Shaki craftsmen have always been known not only in Azerbaijan but far away in European, Asian and African states. Some ancient handicrafts of blacksmithing, jewelry, pottery, leather and weapon craft, silk- and rug-weaving, joinery and ornament manufacture have been preserved in Shaki till nowadays. Of course, in order to protect themselves from enemies, Shaki population was crafting armor, spears, axes, maces, swords, shields, helmets, daggers -- in short, all weapons known in those times. As centuries earlier, tourists can buy jewels and engravings of local craftsmen in Shaki. Due to Shaki craftsmen, merchants and traders from Great Silk Way used to gather in Shaki caravanserais – places designed for trade. Two of them -- The Upper and the Lower caravanserais, built in the 18th century -- survived until now. Shaki is wide-famous for its silk carpets. These carpets are eye-catching for being hand-made, their colors and quality. Shaki carpets, which stand out for their unique features in the Azerbaijani carpet-weaving art, are sold to local and foreign markets and are precious items in personal collections of their owners. Shaki, which have seen both thread and thrum during its almost-3,000-century life, is always glad to receive more and more tourists and ensure them to get positive and memorable emotions.